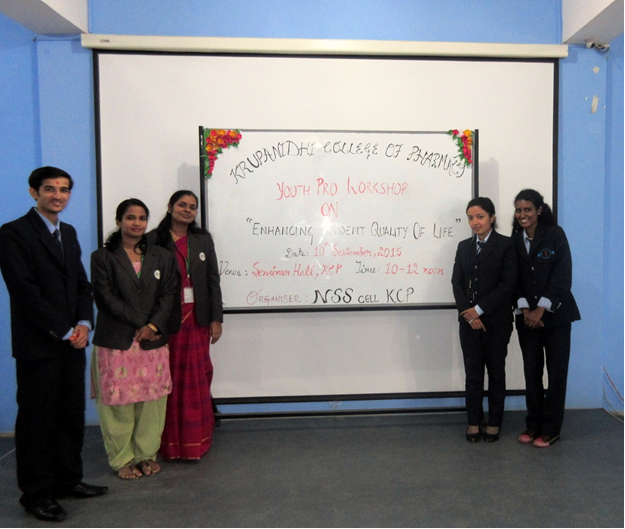 The Youth Pro Workshop on “Enhancing Student Quality Of Life” was organized by NSS cell, Krupanidhi College of Pharmacy, Bangalore on 10th September 2015. The workshop was held in association with the technical support from Positive Psychology team from NIMHANS Center for Well-being, Bangalore. A total of 24 delegates from Commerce and Science department, studying in Krupanidhi Pre-University College participated in this event. 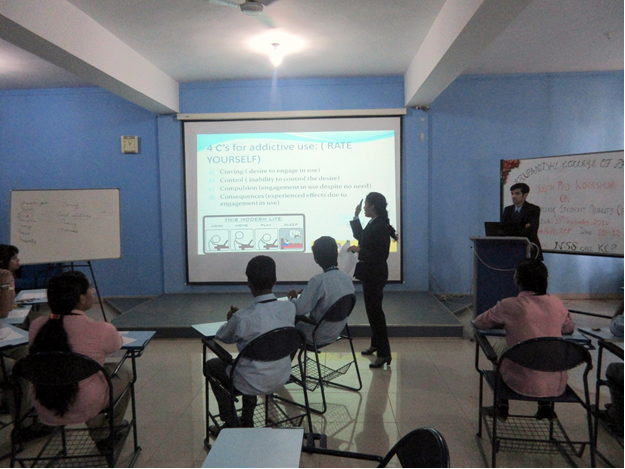 This workshop was organized by NIMHANS center for wellbeing – Positive Psychology Trained Youth Pro – Resource members Ms. Riju Pathak, Mr. Trushit Patel and Ms. Nancy Ashok along with Youth pro workshop facilitators Ms. Rajeswari & Ms. Teena Nazeem of Krupanidhi College of Pharmacy. 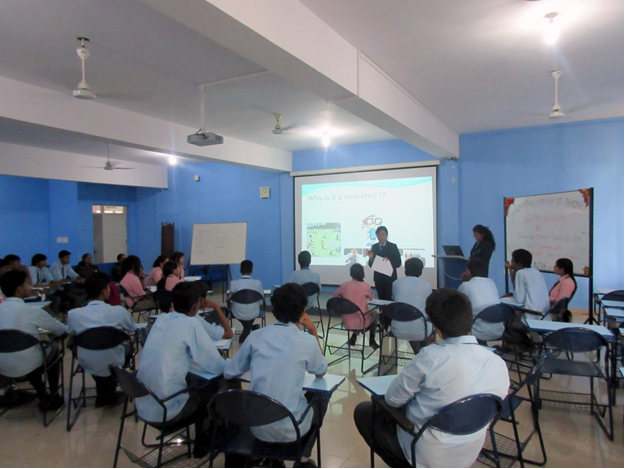 The objective of the workshop was to promote mental wellbeing among students. The event commenced at around 10 a.m. and the inauguration was graced by Dr. Raman Dang, Principal of Krupanidhi College of Pharmacy. Professor Prakash V Mallya, Director- CPPA, of Krupanidhi College of Pharmacy and Ms. Rajeswari R., NSS Officer and organizer of the event. Each of them enlightened the delegates with their valuable & inspiring words. The participants were given a questionnaire prior to the session to be filled in order to assess their understanding on “Quality of Life” , “health” and various other aspects to be touched upon in the workshop. 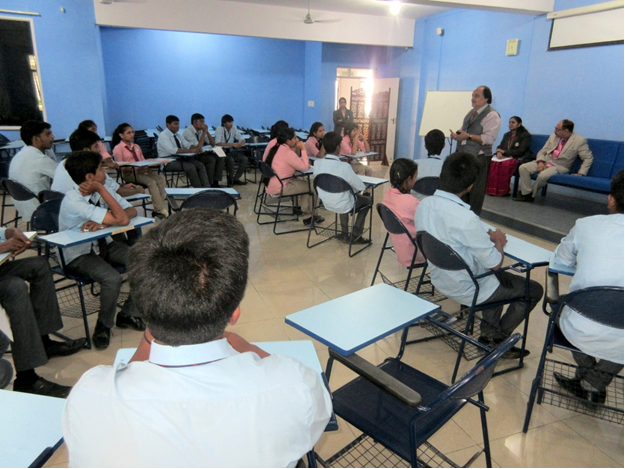 The session commenced with an open floor question on “What the students understood by the term Quality of life”. Starting from the basics on how WHO describes Health, all three aspects of well being, namely, physical, mental and social well being was discussed upon during the course of the session. Under social well being, aspects like Maintaining healthy relationship with Friends and Effects of Technology Addiction were discussed. The core idea on Mental Health was touched upon wherein the students gained understanding on the issue through Lecture & enactment by the resource members; and also Case study- Activities for delegates on topics like Stress, Anger, Depression and its management. They were further trained for peer support through another piece of enactment by resource persons and a group activity. The session ended with a Final Activity for delegates on self-talk relating to Depressive thoughts versus Realistic thoughts, on the case given to delegates. The workshop was successful with whole hearted participation of delegates, throughout the session. The workshop was concluded with distribution of certificates to the organizers & delegates by the guest the event Dr. Narendra, Campus Registrar, Dr Sonal Dubey, Vice-Principal, & Advisory members of the programme Dr PV Mallya & Dr.Raman Dang.